Manchester terminal one and I'm ready to check in......always nervous that my bag will be overweight but it came in 3kg's under so room to bring a few momentos home...result :-) whizzed through security & off to find some food & make a few calls before joining the queue to board , constantly checking my pocket to make sure I'd still got my passport & boarding card ! Boarding was quick , found my reserved seat , opened my Kindle and managed 2 chapters before take-off......I love take-off , hearing the engines roar , being pushed back in to my seat & feeling the nose lift.....so much power......then my ears pop ! Another 2 chapters & I'm ready to sleep .Wake up 1/2 hour before landing wondering where the hell I am.....oh yes, on my way to Iceland ! Landing was relatively smooth , sun shining on the airport , this bodes well . Straight through passport security , find my bag which was one of the 1st on the carousel , then off to the bureau de change....the exchange rate for pounds to ISK in Iceland is far better than at home . Now the fun begins.......there's a sea of people all holding plaques with names on them & one of these should say my car rental name...2 scans & I find them. they have my name on the list , all good so far . A short mini bus trip to the depot & I'm several hundred pounds lighter & ready to go in my new best friend...Hyundai i10...cute looking little thing . Steering wheel's on the wrong side ! I set off taking rather easy , need to calibrate my brain to drive on the wrong side of the road . Thankfully I hired satnav (me n maps just don't get along ! ), navigated round the outskirts of Reykjavik and decided it was time to eat. 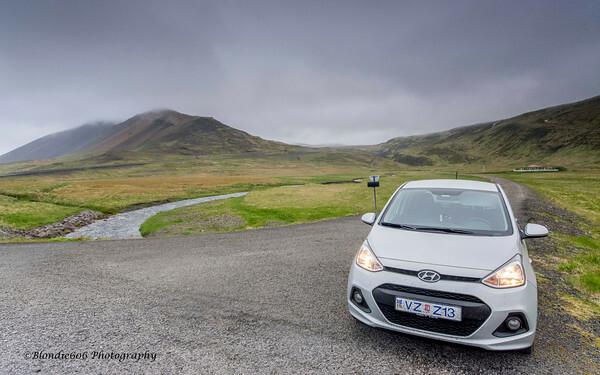 Pulled in at what appeared to be the Icelandic version of Mc'd's......and puts them to shame..... fed & watered, ipod duly plugged in I set off for the 1st hostel at Stokkseyri....lovely roads , minimal traffic & the satnav takes me right to the door. Which was locked! Hmmmmm.....an elderly gent in the house next door starts talking to me in Icelandic , I smile, wave & get the message, door at the side...TAK . Friendly greeting from the host , super room , clean , light ,warm & a hot tub available if I want to use it...clean forgot to bring my cossie ! Breakfast is ready in the fridge for me , wifi is fast & free. A much needed shower, quick browse of places to visit for sunset, though cloud cover is low & decide to grab an hours nap before heading out . 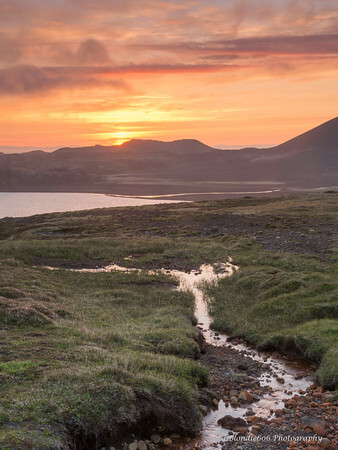 Sunset is around midnight with sunrise around 02:30am.....we shall see what the weather decides to do but Selfoss or Gullfoss are on the cards tonight . Not staying out all night as a long drive to Berunes is tomorrows plan. 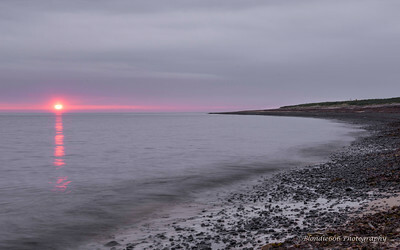 I grab an hours kip before heading off to Gullfoss , this seems to be the best option for a sunrise/set on checking the weather forecast .11pm and still broad daylight.....kinda messes with your head . My body clock was demanding sleep but my brain was ignoring it ! I drove through light rain heading toward the rapidly coloring sky , watching the sunset develop , a little weak and watery but there none the less . 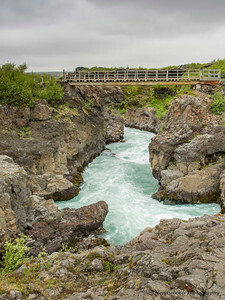 I pulled in to Gullfoss lower carpark , 2 other vehicles already parked up , a photographic tour of 6 people , Americans at a guess & a couple of English . 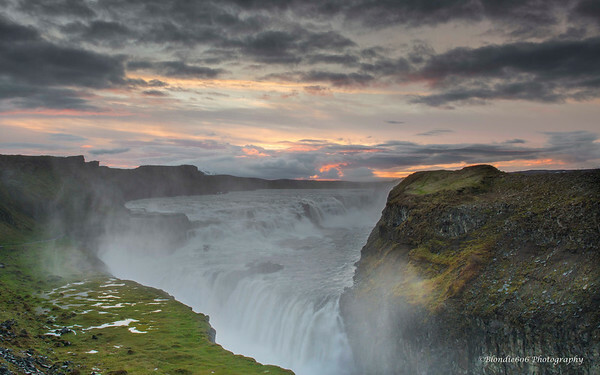 That 1st view of Gullfoss is breathtaking.....31 meters of drop, millions upon millions of gallons of water cascading down , the noise is incredible , the spray carry's on the wind soaking you in seconds . Mother Nature at her most raw , exceeding even the power of Niagra Falls .The color in the sky never quite happened but the clouds made for an interesting , moody sky so I went with it , shots from several angles, constantly wiping the filters. There's a path running down the side of the falls taking you up close & personnal with the 1st massive drop, I declined to go down though admittedly any photo taken down there would be even more impressive....if you could keep the filters clear of rain . I decided to head further along Route 35 , towards the snow capped mountains to find a viewpoint for sunrise...approx 1.5 hours time . Route 35 screams to be ridden on a bike , smooth surface , flowing twisties....all the way to the point it turns to a gravel track...my point of stopping as 2 wheel drive vehicles are not permitted on gravel roads . 4x4 next time for sure . I about turn & retrace my route,keeping a watchfull eye on the sky in the rear view mirror.....I see the color coming just as I find a small pull off point . Torn between drinking in the whole beauty of the place & getting some shots , I decide photo's need be taken , the winding road is my lead in to start . By 02:30 fire is blasting across the sky , I take several different viewpoints then stand in near total silence , just the breeze and bird song for company . Jumping in the car I head back to Gullfoss , too good an opportunity to miss . 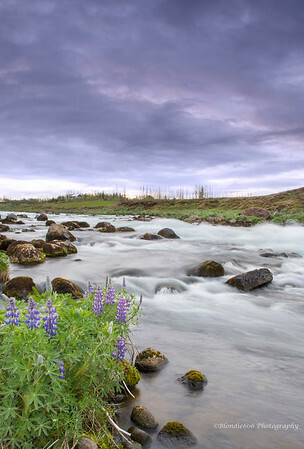 Half an hour later I decide I really need to sleep so set off back towards the hostel , stopping just once ,after a small single track bridge across a wild river edged with Lupins where I spend an hour or so . I arrive at the hostel just after 5am , so much for not staying out all night , set my alarm for 11am and am asleep before my head hits the pillow . Sensory overload on top of 23 hours awake does that for you. Woken by some noisy guests just after 10am......breakfast , cup of tea & pack the car . Today I head for Berunes , along Route 1 approx 540km's , satnav says 6 hours 10 mins without stops........& I duly set off in the wrong direction which doesn't help ! 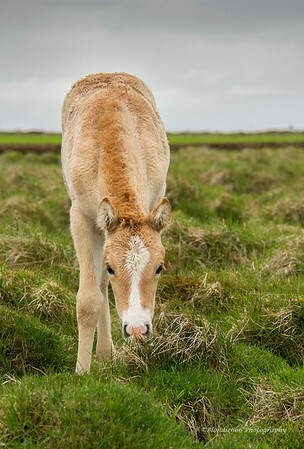 Still , I manage a couple of photo's of some Iceland foals so not all bad . About turn & get back on track , the road is long and for the most part early on , very straight . Seljelandsfoss & Skogafoss appear on my left , crowded with tourists so I opt to carry on past & plan to visit on the return journey. The weather is as forecast , ridiculously low cloud & rain.When the cloud does lift the views are stunning, the landscape changes with every corner , from lush greenery to black volcanic ash to moon surface( at least that's what I think it looks like) . I'm torn between wanting to stop every 5 minutes and wanting to get to the next hostel before midnight so for a while I let my eye's take the photo's . One thing I never tire of is the seeing the 4x4's with tyres the size of my little hire car...... Eventually I have give in & pull over to take a couple of shots , the sun is catching the tops of the distant snow covered mountains , blue sky is breaking through & small clouds drift across the sky...too good to miss . 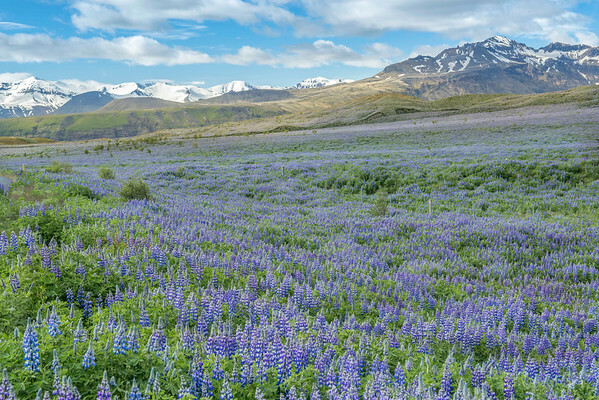 The road bends right & I'm greeted with a sea of lupins on my left leading upto the foot of the Myrdalsjokull glacier & I stop , it's simply stunning . I leave the tripod in the car or I'll be there for an hour.....that's another place to stop on the way back. 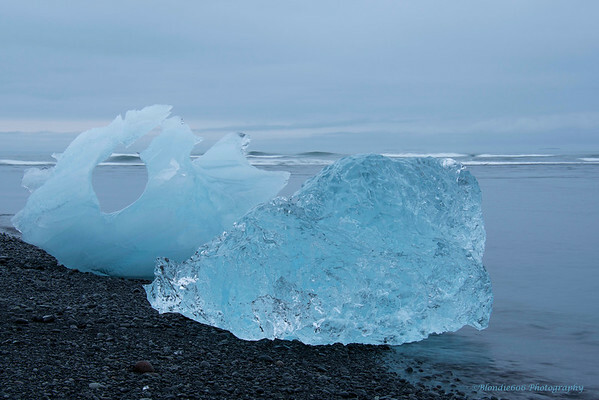 Finally I reach Jokulsarlon Ice Lagoon , as expected it's rammed with tourists each with a camera .Take a couple of record shots as the cloud is still low , have a bite to eat then on my way again . A glance to my right as I drive off confirms there are still pieces of ice on the black beach where it flows out from the lagoon . That is a definite stop on the way back irrespective of the weather though I can hope for sunshine ! The scenery takes yet another change , the road climbs and runs along side a ffjord, I imagine this is what scandinavia is like ( though I've never been) , as always the views take my breath away , though as the road gets twisty & tight I have to concentrate harder . Mist is rolling in off the water and I need to stop to let my eyes and mind take it all in , alas no stopping places , so I pull up on a straight bit and just sit for a few moments. The twisty tarmac continues for another 20 or so kilometers then the satnav says 5km's to my destination just as the road turns to gravel slowing me down and letting me take the views in To my left mountains clothed in green and yellow , to my right a ffjord , rocks dotted along the shore line & across the water I see a few houses .The track carry's on for another kilometer before turning right across a single track bridge & I start the climb up the other side . The satnav announces "you have arrived " - Hmmm.....I don't think this is where I'm meant to be ! The lady of the house confirms it , Berunes is 15km's further on . 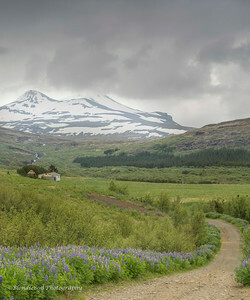 I'm strangely not disappointed , more vista's to be seen and they did not let me down........almost flat calm waters & snow capped mountains to my right , towers of volcanic ash and rock to my left, sheep grazing by the roadside and swathes of lupins , their purple color contrasting well against the lush grass . I can't recall a journey quite like it , 8 hours of surprise views round every slight bend.......I'm running out of superlatives for this road . I spot a small sign to my left - Berunes & I arrive at the hostel just after 20:30 , tired but happy . Quick change of clothes , cup of tea & study of the map then I head out again to a little village 15k away to fuel up . 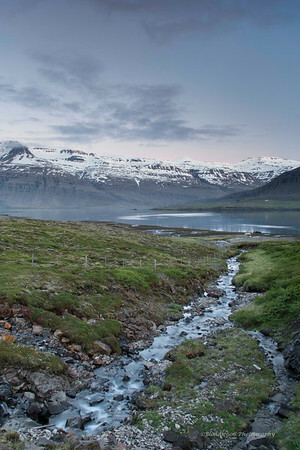 The road to the village of Brieodalsvik offers yet more superb scenery & I spot several likely places for sunset . Fueled up I head back and pull over at the side of road , camera out & wait for sunset . It kinda never happened but the sky was interesting with just a hint of color . Not a soul passed on the road , the only noise was Arctic terns & Eider ducks who make the most peculiar sound , almost like a laugh . I decide to drive further , back past the hostel , spot a bit of color on the mountain tops , a gateway on my right & pull over quick . This is the most frustrating country , plenty of views to photograph but stopping places few & far between ! I walk down the grass verge & start setting the tripod up & it breaks......one of the legs falls apart , not what I need at all ! I cobble it back together & find that as long as I don't try to extend the middle section , it will hold position . Cloud cover gets thicker so at 02:30 I decide to call it a night & go get some sleep , still pondering what to do tomorrow -actually I mean later today ! 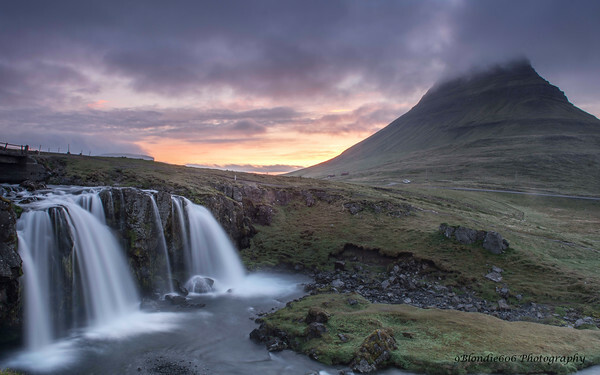 Initially I was aiming to visit Godafoss , some 3 hours to the north but then think maybe heading back to Stokkseyri with plenty of stop time would be better . Back at the hostel , cup of tea & I get the map out again , Godafoss is very tempting so I decide to sleep on it , it's 03:45 by this time & I'm feeling tired . 8am I vaguely wake up & decide to snooze a bit longer as it's gonna be a long day . 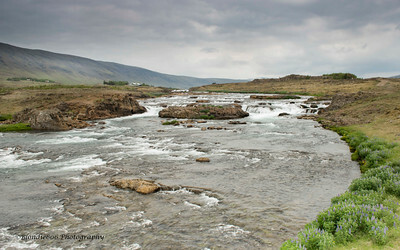 10am I get up,shower , add to my diary , phone Dad for fathers day & decide sod it , I'm going to Godafoss so I load up & head-off . The satnav doesn't like Myvatyn so I programme it in stages , 1st point is Egillstadoir , again on Route 1 the main road round the country & what a beautiful road , continuing to provide perfect vista's at every turn . It heads through a valley , waterfalls to many to mention & then turns to a gravel track that wouldn't look out of place on a Rally circuit ! It climbs and turns , hairpin after hairpin & I'm giggling all the way . I have to stop & look back , sunlight breaking through the low cloud . 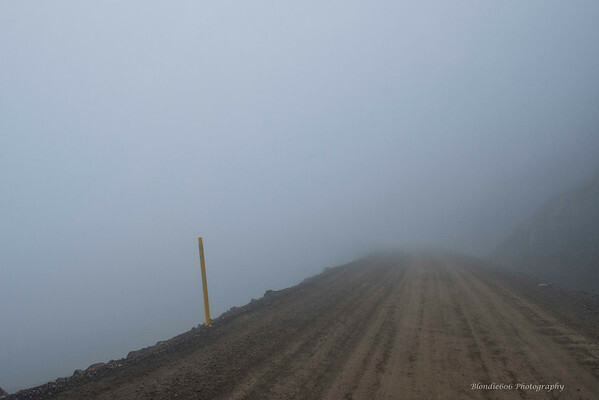 The hairpins get tighter , blind brows & I'm at the top though the cloud is hiding what should be a stunning view ! Gravel road is somewhat an understatement, essentially it's a farm track ! 5 bikes come in to view , all BMW GS's fully laden . Now I love biking but they were insane , I'd have fallen off at standstill on that road ! The descent is just as wicked , twisting & turning till I drop below cloud level & again am left breathless at the views . 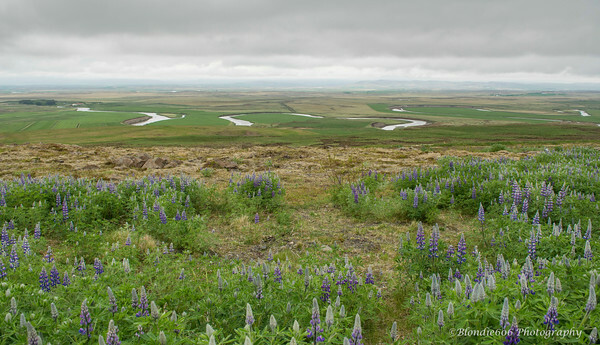 To my right fields of lupins stretching away to mountains , to my left a body of water leading to more mountains . The tarmac starts again & I spot reindeer at the road side with massive antlers . 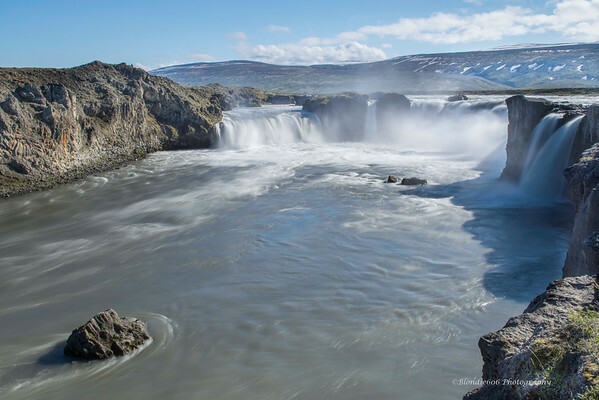 As I'm wanting to reach Godafoss before teatime I push on deciding that today I will be a tourist , not worry too much about photo's , just let my eye's and brain be my camera . Quick stop for food & drink & I'm off . The next 3 and a half hours see's me driving through scenery that takes my breath away every 500 yards , impossible to describe as I'm fast running out of superlatives . Very little traffic considering it's the main route north so I plod along in my little i10 drinking in the surrounds . 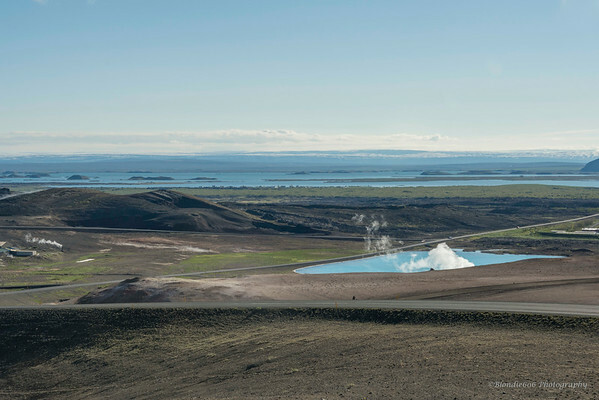 The tarmac is near perfect , either side of me are mountains , lava fields , lupins , the occasional flock of sheep, I drive through valleys then climb up to drive along the top allowing picture perfect panoramic views , even the weather is playing ball, sunshine and blue skies . I crest a hill , see a Parking sign & pull over . The light is all wrong but view needs recording . Stretching out in front of me is mile after mile of flat browny yellow earth, a couple of rivulets running through it to mountains in the distance , behind me the earth is more yellowy, dotted with clumps of hardy grasses , pockets of snow dotted about & more mountains in the distance . It 's what I imagine the moon surface might look like , minus the blue sky & fluffy clouds obviously . I stay for 1/2 an hour or so then set off again, concious of the time . After many km's I crest a brow , spot a tourist stop on the left , packed to bursting & then in to view comes the most incredibly vibrant sapphire/aqua blue lake I have ever seen , along with a strong sulphur smell and plumes of steam . Heading past the pull in & down the hill, the lake is some sort of public spa & I spot people gingerly dipping their hands in the water which judging by the steam is very hot ! Lake Myvatyn comes into view , the same unworldly aqua/sapphire color . I stop at a gift shop to check which direction I should be heading left turn , follow the lake & keep going , Godafoss is literally next to the road so I shouldn't miss it . The next few miles takes me past several more of these vibrant blue lakes , again I'm tempted to stop but time's against me . The road climbs and I see one of those Big views , blue sky , large fluffy clouds , a sapphire blue river twisting through vibrant green fields . I pull over , grab the camera & open the car door - no one warned me about the midges , my god they're huge ! I tend to be a 3 course meal for midges so no hanging about , couple of shots & back in the car . Know I now why I saw several people in Myvatyn wearing nets over their heads ! Eventually I crest hill & see a plume of mist to the left , then a mass of parked cars & I have arrived . Though the sky is still big the light is completely wrong for photography so I take a few record shots from 3 view points then just stand and watch the water cascade over the falls. I can imaging sunset or sunrise here would be perfect, particularly in winter . Next year maybe ??? I set off for home pondering what to do tonight . I settle on a steady pace as no real rush to get anywhere . I arrive at the vibrant blue lakes & this time stop for a couple of record shots . Although it's actually quite warm I put my hat & fleece on as would rather not get bitten to pieces by those super sized midges . The pictures disappoint as don't do justice to just how vibrant blue that water is . I do the same at the tourist spot at the top of the hill after leaving Myvatyn , another record shot showing that amazing heated pool at the bottom of the hill. 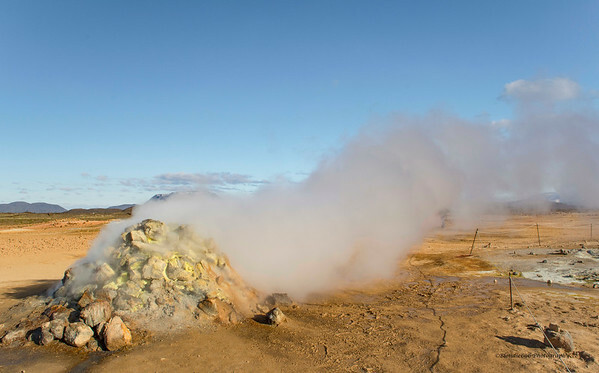 My next stop-off is the Geo Thermal area , I didn't know that's what it was till I parked the car & read the information board but 'd seen a gathering of vehicles on the way past in the morning so figured it would be worth a stop . The 1st thing I noticed on opening the car door was the smell , strongly sulphuric , then I heard strange plopping noises & a whistling hissing most bizzare noise , kinda like a boiling kettle meets steam train type of noise . Camera in hand I head down the roped pathways to see craters of various sizes filled with bubbling grey mud , boiling mud I should say . Other areas just had steam rising from them,the surrounding soil turned orangey grey , the inner earth forcing it's way to the surface , mother nature is pretty dammed impressive . 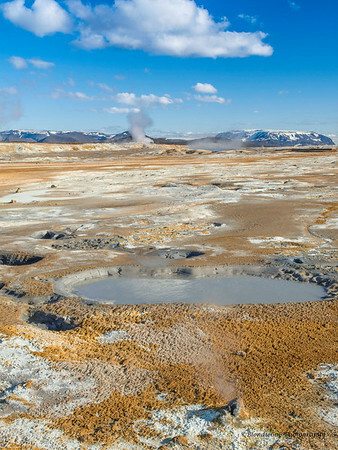 I look round for the source of the hissing and spot 2 large vents , rocks placed around holes created by the steam breaking the earth's crust causing it to plume . Looking round some more I found 3 other such vents . Going back to the 1st one I took a quick video , more to remind myself of the noise ,. This would have been much easier had there not been a large woman seemingly giving herself a steam bath in the plume from this vent . Seriously ! She must have stood in it's flow for at least 10 minutes - There are some very strange people about ! Concious that time was marching on I headed off , back on to Route 1 heading toward Berunes . 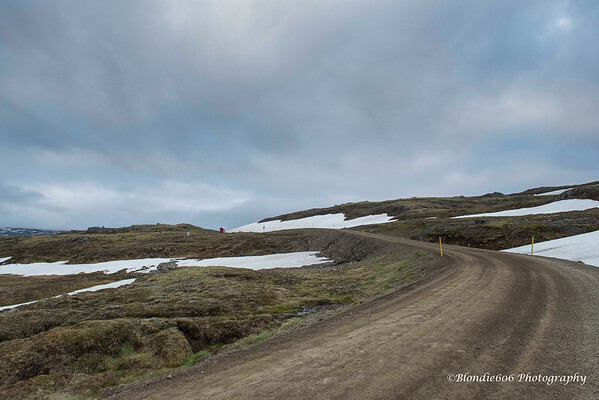 Given that for a large amount of time the weather in Iceland can be dire , snow ,wind , rain & low temperatures , the road surfaces are surprisingly good , the odd pothole but that's about it . 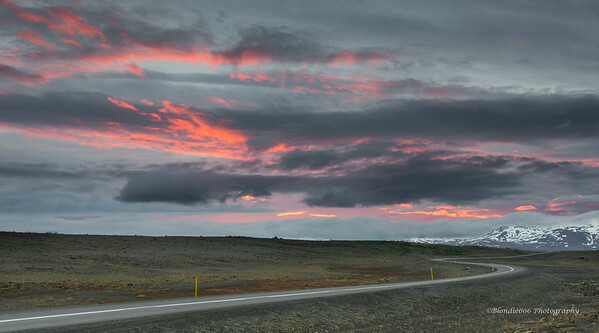 Roads are lined with yellow marker poles presumably so that in the snow you can judge where you're meant to be driving - off road driving is frowned upon as Iceland is very ecologically minded , protecting nature is a high priority. I keep seeing vista's that I want to photograph but again a lack of pull in's stops me. I round a bend on a hill & finally have to give in , I pull up on the road about 50 yards from a corner & take a couple of shots . I promptly get hooted at by a very upset Mitsubishi driver ! 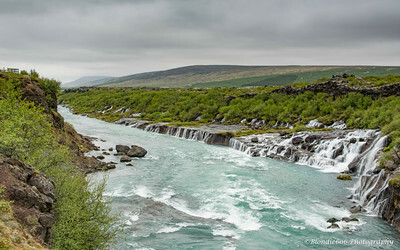 I could quite easily have spent 2 days on the road back from Godafoss , so many photo opportunities it was mind boggling . The scenery varied from deep tree lined valley's to lava fields covered in Iceland's unique greeny yellow moss , fields of black lava , huge expanses of sand and earth peppered with rocks , pools of aquawater , snow capped mountains , rivers snaking through lush green fields peppered with bright yellow flowers & swathes of Lupins and rocks, massive rocks , that appear to have been placed in position by magic as they were so far from the nearest mountain . The strangest thing , which might have been my mind playing tricks on me , but several of the lakes I passed appeared to be sloping - I kid you not . I should have taken photo's but my OCD would have spent ages trying to level them up when in fact I couldn't , so I settled for my minds eye camera . The journey back gave me more opportunities to say " OMG , how stunning is that" "wow " and many other superlatives . I passed through the village of Egilsstadoir where I'd stopped for food on my way out & began the climb back up the dirt track where I'd seen the BMW's all those hours ago. As I crested the the top of the track I had to stop . I was faced with a wall of fog ! I turned & checked behind me , the road was clear & bright , a cloudy sky but visibility was good , In front of me approx 100 yrds visibility , this should be an interesting trip down all those hairpins with steep drop off's ! 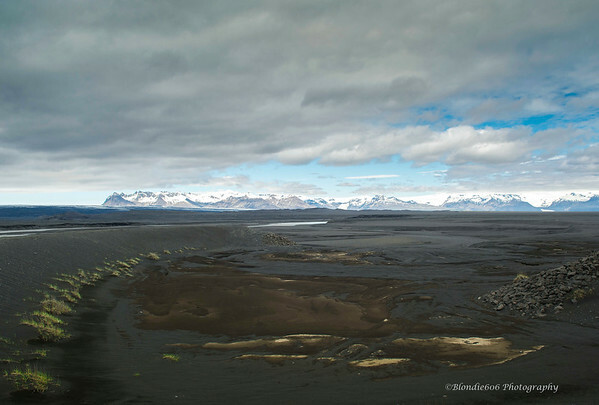 I had by this time decided that I would head straight back to Jokulsarlon so on arrival at the hostel I went straight to reception & asked to check out . The young chap behind the desk looked worried & confused, "is there something wrong ?" 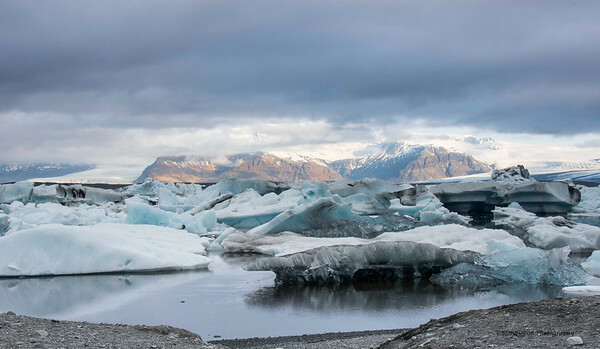 It took a little explaining that everything was fine but I'd just decided to head to the Ice Lagoon for sunrise . He looked a little bemused and then only charged me for one night stay which I thought very good of him , as it was so late they couldn't possibly re-let my room that night , it was 22:30 . 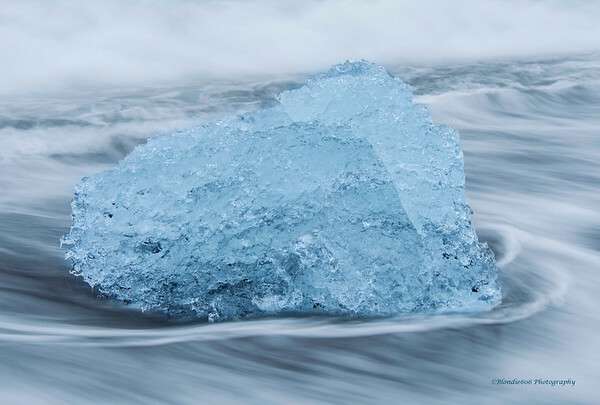 I had a quick shower , grabbed my bags & headed off toward Jokulsarlon , ETA was midnight-ish though I suspected it would be much later given there were a million things to photograph en-route. The night was bright and still , no wind & the reflections in the water as Route 1 hugged the ffjord were just perfect . Many times I was tempted to stop but couldn't see a suitable route down to the waters edge , damn & blast this place , how frustrating ! Eventually I rounded a corner , to the left was a mini cove with beach & mirror reflections & on my right was a pull in , perfect ! 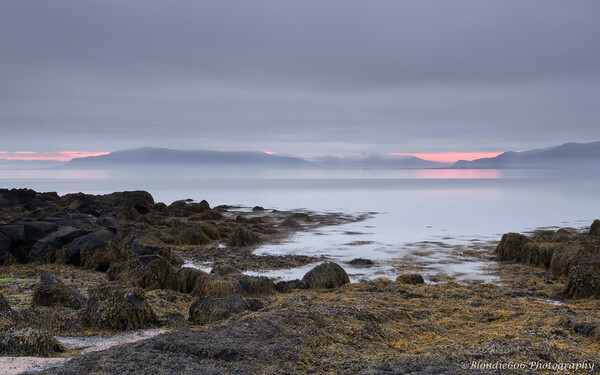 Mist was rolling in across the water , shrouding the distant hills giving a quite eerie but peaceful feel to the place . Tripod in hand I headed down to the waters edge , apart from the crunching of shoes on sand & shells the only other sound were the birds , Arctic Terns & Eider ducks again. Given that it was gone midnight & I was alone in the middle of nowhere in a strange country I never at anytime felt concerned or worried for my safety. I'm fairly certain that I would not feel the same in the UK which is quite sad really. I spent around 45mins here, it was so peaceful time just slipped by . 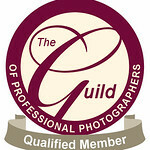 Photo's taken I hit the road again , determined not to stop until the Lagoon . It was a little misty with that rain that's not quite there but the greenery still glowed , vibrant against the black volcanic rocks and the drive was still as stunning , seemingly nothing can dampen my love of this place . I spot many more photo opportunities on the drive but resist the temptation to stop , Ice beach here I come ! I finally arrive at 01:58 , the top of the beach empty barring 2 small tents , a shogun and me . I suddenly realise I'm hungry , it has to be a least 6 hours since I last ate . Cheese salad sandwich and a Tunnocks caramel biscuit to the rescue ! From the car I couldn't see any ice just sand , pebbles and the sea with cloudy grey skies , not quite how I'd imagined it or how I hoped it to be . I spotted another photographer heading over the pebbles so figured I might not be getting the whole scene . Welly boots on & off I go , quite mild as well , roughly 8 degree's with barely a breathe of wind . That 1st sight of the ice beach will stay with me forever . 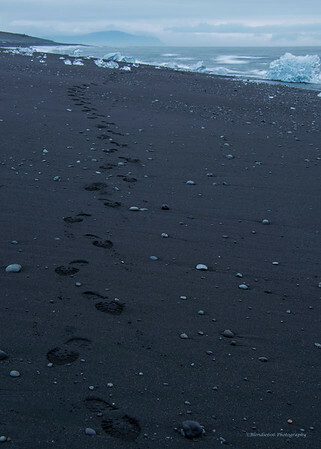 Jet black sand littered with pieces of ice in all shapes and sizes , some pure see through , some that stunning aqua blue , some just stuck in the sand , others being lapped by the waves . I'd seen many photo's of the place but they hadn't quite prepared me for the reality . I must have stood just looking for 10 mins before I remembered why I was there ! Not quite sure where to start I set the tripod down & started snapping , the 1st few attempts not quite what I was looking for so I wandered further along the beach , the smile on my face growing ever wider . 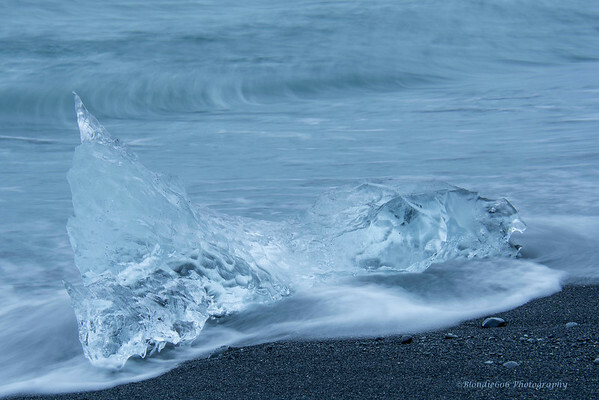 I have experienced some really surreal moments over here but this one tops them all , 02:30 , Jokulsarlon Ice Beach with just the sound of the crashing waves and the birds and I suddenly felt so relaxed and happy. 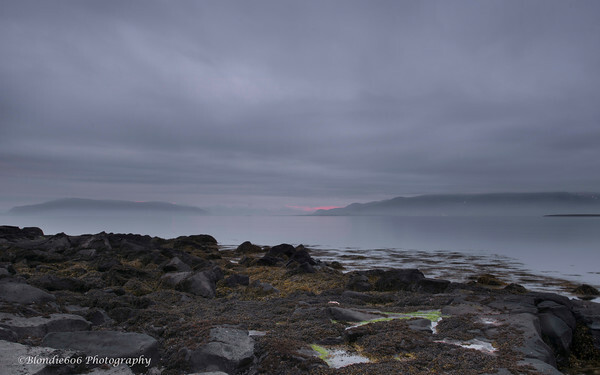 The sunrise didn't really happen so I didn't get the light I was hoping for but even that couldn't dampen my spirits . I spent about another hour snapping away then headed back to the car for another Tunocks and some juice . 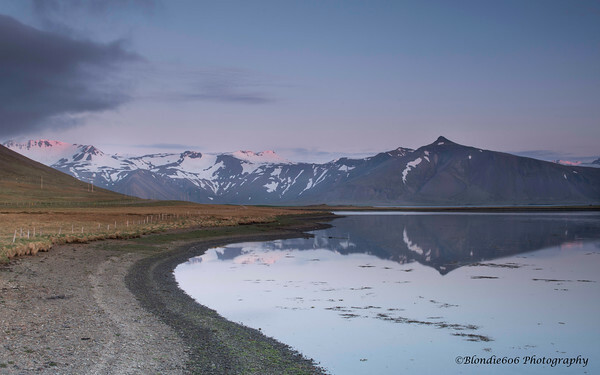 The other side of the road was the Ice Lagoon & I saw the sunlight just starting to light the tops of the distant mountain peaks so started the car & said so long to the beach though I could happily have spent an entire day there ! I parked up and sat for a few moments watching the icebergs floating , the occasional one breaking down with a thunderous crash . There were only 2 other cars around plus a couple of camper vans , so different from the flying visit on saturday, but then it was only 3am ! 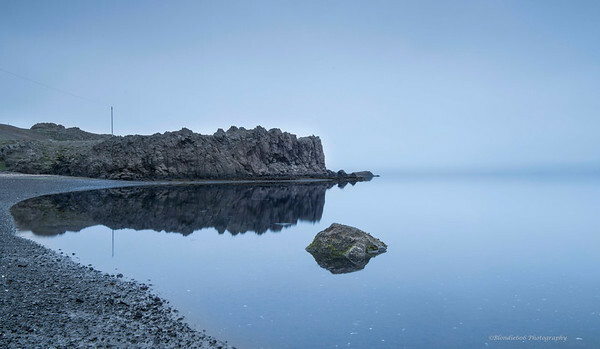 The lagoon was flat calm with perfect reflections , the bergs varying in color from crystal white to aqua blue and black where they had absorbed volcanic ash. 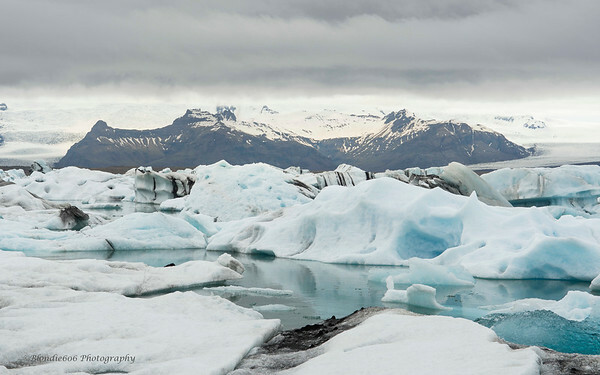 The backdrop to the lagoon was the massive glacier stretching back as far as the eye could see to the snow capped mountain peaks glowing with the 1st rays of sunlight and topped off with black and grey clouds . It simply took my breath away . I got busy with the camera & before I knew it , it was 5am & others had started arriving so I headed back to the car for another sandwich . At this point another of those bizarre moments occurred . The car park is on a slope , and is just gravel . 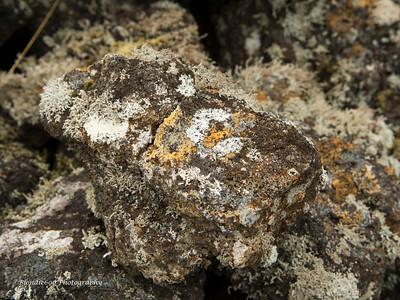 In Iceland terms gravel is actually more like mini rocks & boulders , lots of them , sharp edged, black & grey and very very loose . I hear engines to my left & see 4 BMW GS's come in to view , all kitted out with metal panniers , laden with camping gear , riders all standing on the pegs looking around . Through their lids I can just make out grey moustaches . The last bike in the group was the real surprise , a Honda CBR RR , fully pannier'd up ,ridden by a rather mature gent with an open face helmet & grey beard. Hats off to them , Id've been on my backside had I dared to take my bike over such a surface ! Time to hit the road again , the the next hostel is at Stokkseryi , the same one I stayed at the 1st night and it' still a good 4 hour journey but I'm taking it easier today , intending to stop at any & every opportunity . The 1st stop came up rather quicker than anticipated , less than a mile down the road . 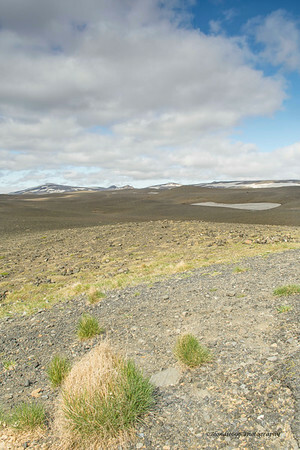 On the journey to Berunes I'd seen what appeared to be a viewing point right in front of a glacier and there it was . The track to the parking area was rough , littered with rocks & ruts & I worried for the underside of the car & the tyres so drove like aunt daisy at 5 kmh not daring to take my eye's off the track for fear of hitting a deep hole or rock ! 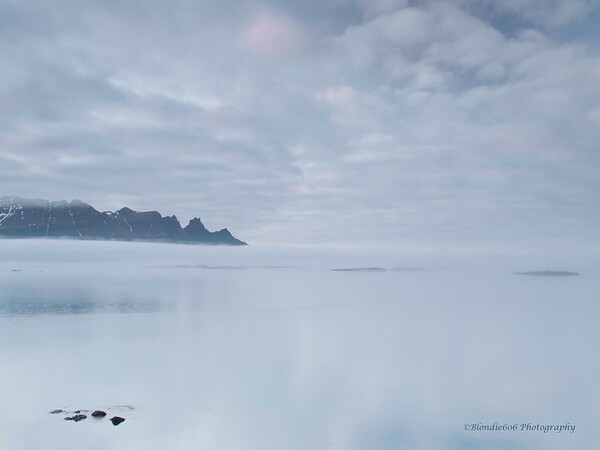 I parked up & took a look around , in front of the glacier was another lagoon , not a breath of wind so yet more mirror reflections of huge icebergs . My eye's followed the water back to the glacier and the mountains surrounding it,the green & yellow vegetation starting to glow in the sun and again that OMG feeling swept through me for the thousandth time . I fired off half a dozen shots and headed off, there were other places I wanted to stop and I was starting to feel tired . 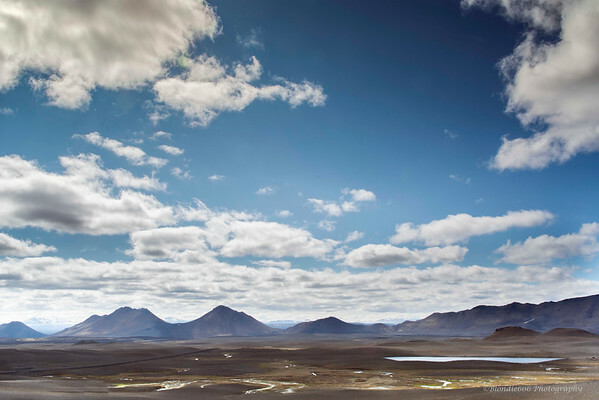 I drove gingerly down the track back to the main road , turned right & settled at a steady 90kph , no other vehicles in sight, just black winding tarmac ,blue sky and fluffy clouds. 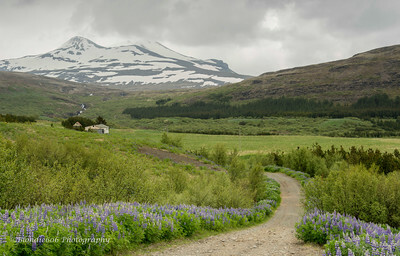 A few miles down the road the lupins came in to view, the ones I'd seen on the way out , swathes of them covering the mountain side . I spotted a pullover and turned off , gingerly again , not wanting to rip the front bumper off the car ! 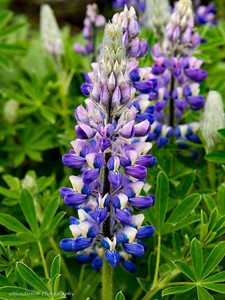 The scent of a thousand Lupins hit me , natural aromatherapy & I felt the tiredness start to lift . I set the tripod up & spent a good hour trying different angles , making sure I took the whole scene in , the Lupins in the foreground leading up the mountain side to snow capped peaks and fluffy clouds . Feeling refreshed I headed off , a couple more stops just for record shots of the scenery and then the tiredness hit again . It was roughly 26 hours since I'd last slept , I'd covered a huge mileage & hadn't exactly eaten well . Common sense kicked in so I found a pull in , reclined the seat & shut my eye's . 45 mins later I woke up , not entirely sure where I was ! My catnap did the trick , now all I needed was a cuppa and some food . I vaguely recalled a service station at the next roundabout which , according to the satnav was about 45k's down the road . 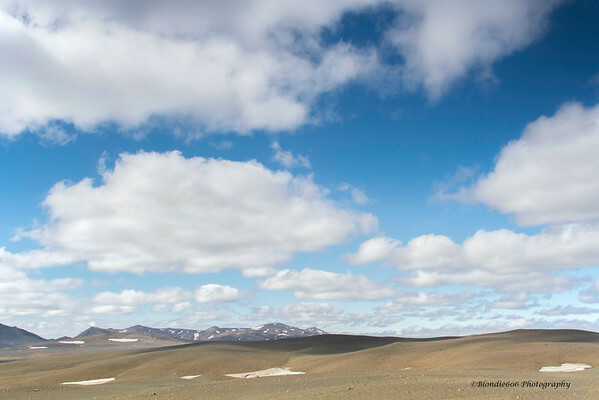 I recalled seeing a place on my journey out , just to the side of the road with a small car park in front , in the middle of nowhere , vast open plains stretching as far as the eye could see to distant snow capped mountains . 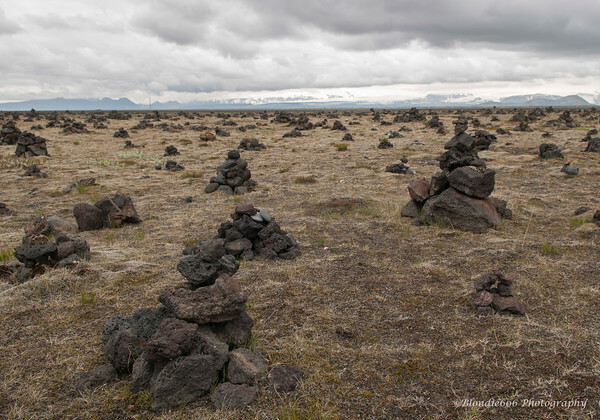 I remembered a small hill covered in & surrounded by , what looked like termite mounds ...not really likely in Iceland ! 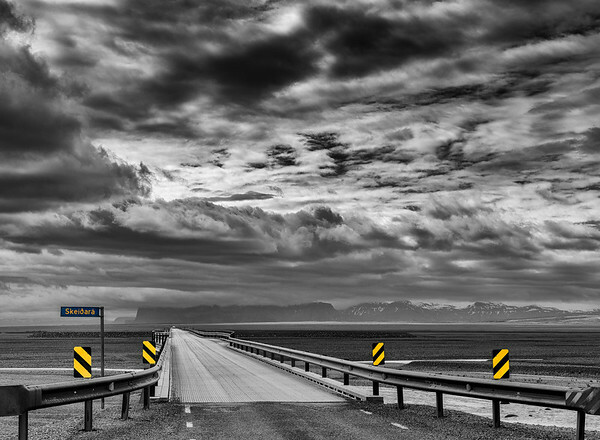 I knew it was somewhere on Route 1, after the service station & before Jokulsarlon so I slowed to a steady 80kph and scanned the scenery for the next few miles . After a few km's I spotted a couple cars parked up on the right then saw the small hill so turned in to the carpark . Most bizarre . 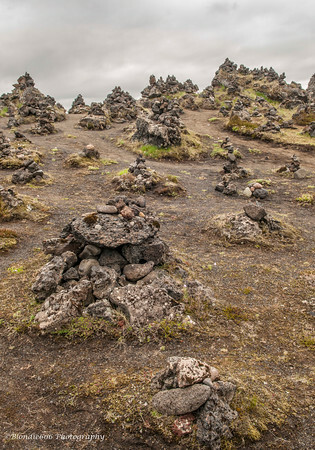 An area , I guess the size of a football pitch , covered in upright piles of stones & lava rocks making small towers . 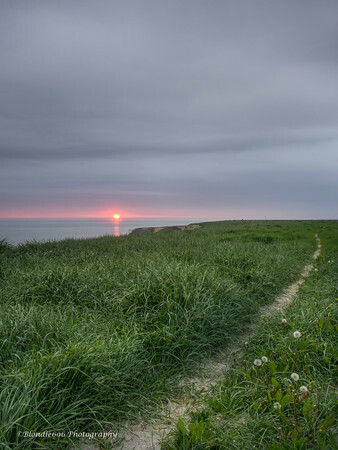 A few had wild flowers growing by them , a couple had little notes and trinkets by them , no clear path through or around them , just randomly placed .The hill was also covered in the same but had paths leading through them . The good light had gone , it was harshly bright yet hazy with little detail in the sky but I wanted to record the sight so spent 1/2 hour with the camera trying to get something that would convey this surreal scene . As my memory is a little less than good at times I also took a shot of the Information board ! A coach pulled in to the carpark and that was my cue to leave....must have been 50 or so people on board , so I headed off in search of food and a cup of tea. The service station loomed in to sight and I pulled in, ready for a cup of tea. No hot food available but they did have some warm croissants and sweet pastries. Foolishly I expected the croissant to be sweet but found it filled with a ham & cheese mixture, odd but very tasty . I noticed a tour bus pull in right outside the window just as I was looking at my phone to see if wifi was available. The phone had already connected , to Grays Line open wifi and then I remembered that these tour coaches have wifi on board ! I checked the weather quickly before the coach pulled out, still looking fair with no rain. Feeling better and more awake I headed off , Vik was my next stop for the Church on the hill . 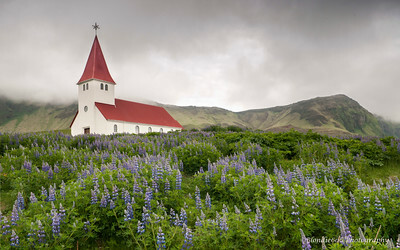 The basalt columns of Vik headland came in to sight, the fuel station I recalled from an earlier visit and then I saw the church, up on the hill to my right, lupins all around it & for the 1st time on the trip I took a wrong turn ! Quick about turn and I pull up behind the quaint white church , relived to find no-one else there . Tripod out I walked round to the front & headed down the hill to get my shots . Nice low Point of view with lupins filling the foreground,contrasting well against the white church walls , the red roof standing out against the grey clouds that shrouded the mountains behind . An hour or so later folk started arriving so I packed up & headed off , another box ticked . I had intended to call at Dyraholey but the weather was looking less than favourable so decided to save that area for the next trip , yes , I was already planning next years visit ! 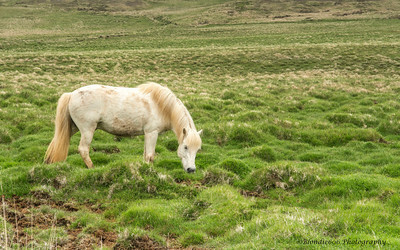 The problem I was finding with Iceland was there is just so much to point a camera at ! 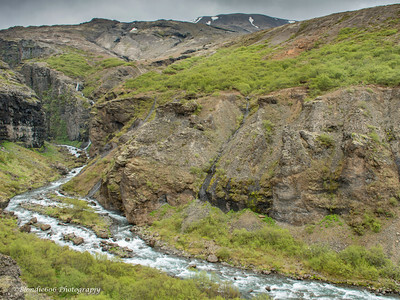 I could easily have spent 3 or 4 days just on Route 1 from Stokkseyri to Berunes ! Next stop was Skogafoss , I knew it was going to be difficult to get clean shots as it was now heading toward lunchtime & the place would be full of coaches and tourists but there was no way I was going to miss it . I pulled in to the car park & sure enough space was very limited . The i10 is small & I found a slot just made for it ,grabbed the camera & headed to the falls . Impressive both in sight & sound Skogafoss is one of the sights that you need to see on any trip here .The sky was a little bland so I concentrated on just the fall & surrounding rocks. People seemed to ebb & flow toward the base of the falls , stopping just long enough for the obligatory selfie ,which gave me the chance for one of the shots I wanted ,one that would help to show the scale of the place. About 1/2 hour later the place just seemed to clear, I guess the tourist buses all run to pretty much the same timetable. This allowed me a little time to fire off another few shots , chat to a couple of folk , one american woman who'd just dropped her Nikon in the water & and wanted to know how best to dry it out ? I still don't know why she asked me ?? Then another load of coaches arrived so I decided to head off. 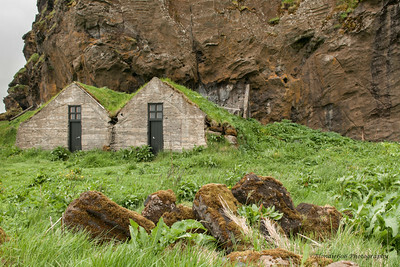 Less than 1/2 mile down the road i stopped to grab some shots of a little turf house built in to the side of a large ,very large rock formation.fascinating little building, giving a glimpse of yester year & a more traditional Iceland . By now it was around 12:30 and I was feeling hungry so made tracks towards Stokkseryi , vaguely recalling a KFC somewhere in a town en-route.The satnav trying to detour me but I stuck to my route , heading toward Hella & Selfoss . In to the town & I spotted the KFC, not the healthyist of options but I needed to eat . 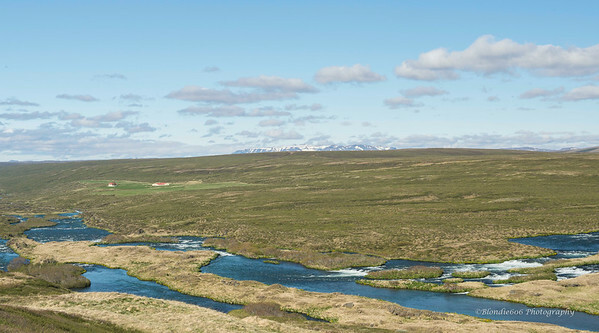 Tiredness was now starting to kick in again , I was heading to the same hotel I'd stayed at on night 1, through Selfoss , turn left & head to the coast . I pulled in to the car park around 15:30 to find the place locked , not what I needed ! The elderly gent who lived next door must have seen me pull in and contacted the owner's wife as within 5 mins she appeared with the key & checked me in to the same room . A much needed cup of tea, shower & hairwash , 1/2 hour on the web checking the weather for that evenings adventure & I finally got my head down for a couple of hours at about 18:30.It had been another very long day but I'd loved every moment . I set the alarm for 20:30, my plan sorted ,I was heading for Kirkjufells on the west coast , approx 2 &1/2 hours according to google maps . The alarm went off way too soon ! Up , dressed & car loaded , another cup of tea & I was on my way by 21:30 . I think it was just adrenalin keeping me going now ! 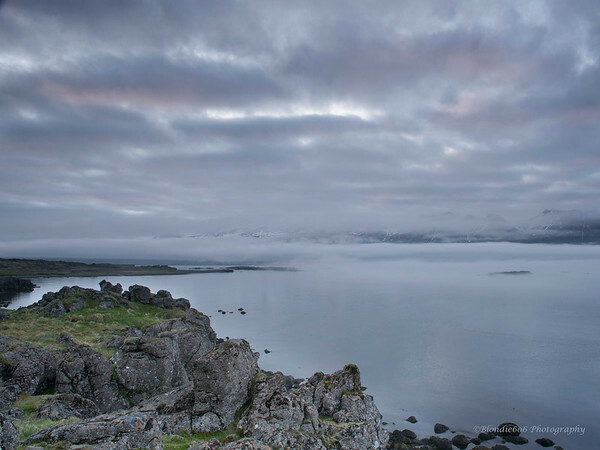 I followed the road round the outskirts of Reykjavik , hugging the coastline , what a view ! Next I saw signs for a tunnel & flippin 'eck what a tunnel it was ! It seemed to go on for ever , 1st downhill then uphill & complete with speed camera's , the 1st I'd seen . Finally I same out the other side , paid the toll & set off on yet more beautiful winding tarmac heading to Borgarnes and a fuel stop . Again very little traffic , lovely smooth tarmac and as the road was quite high the panoramic views were incredible . After many Km's Borganes came in to view below me, the city lights twinkling in the dusk .Crossing the long bridge I saw the fuel stop on my left so I duly pulled in & filled up . I'm getting the hang of these auto pay pumps now ! Leaving Borgarnes I turned on to Route 54 & the road started to climb , unfortunately the mist had started to come down along with fine rain which kinda stopped me getting distracted by the scenery . The little I could see seemed rather flat ,no obvious mountains or hills but as visibility was about 4 car lengths I was guessing . Still , it's another excuse to revisit next year . As the miles clocked up I started to worry that this was not the best place to be heading , I was really wanting a sunrise ! I'd seen few cars on the road , most heading in the opposite direction but now uphead was a vehicle , I guessed at tourists as we'd probably be the only ones daft enough to be out at this time of night . Finally I saw a lighter cloud up head and I hoped I was either climbing above the clouds or the clouds were lifting, whichever it was I started to feel happier . I was totally unprepared for what I saw next , as was the car in front , how we didn't crash I don't know !! The cloud got lighter as the road climbed and went slightly right , as we rounded the bend there was the most vibrant glowing red plume of smoke or cloud right in front of us . My 1st thought was an active volcano ! I hit the brakes at the same time the car in front did & just looked , it was all over in a matter of seconds so even if I'd been prepared with the camera & tripod I doubt I 'd have got a shot . It's a sight that will stay with me forever . The sun was burning so brightly through the mist it appeared the sky was on fire , I was virtually speechless , though I recall a few words left my mouth....it's really not possible to put into words how I felt at the sight before me ! It was one of a few times I really wish I'd had someone there to share the experience . 100 yards further down the road was a pull in on the left , myself & the other car headed in to it & stood grinning at each other for a few minutes . They headed off & I set the tripod up for a few shots across the valley , the sunset starting to color the sky ,a small stream providing the perfect lead in line . 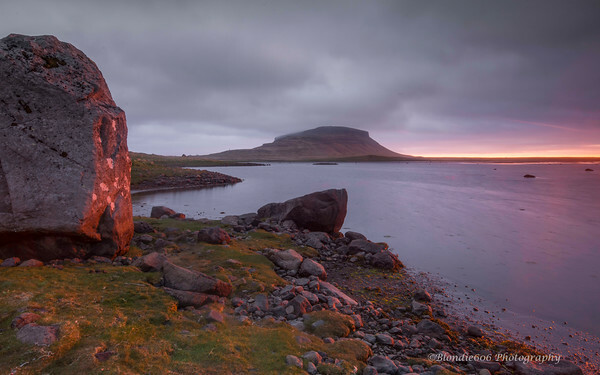 I didn't stay too long , I wanted to reach Kirkjufells for sunrise . A little further down the road I pulled over by the side of a lake , the water totally still giving superb reflections of the surrounding mountains complete with snow capped peaks , at this rate it was going to be sunset again before I reached my destination ! I fired off a few shots , resisted the temptation to follow the road down the side of the lake & headed off again . 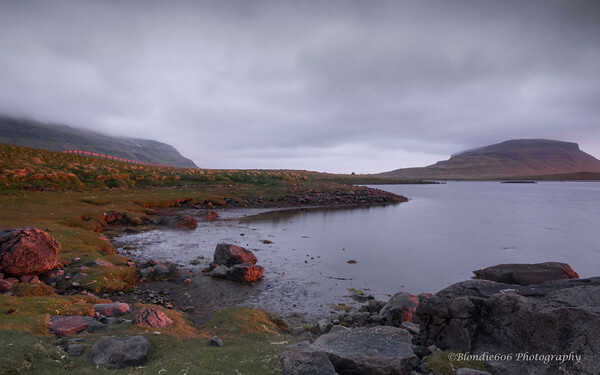 Half an hour later Kirkjulfells loomed in to sight , a carpark right in front of it with just one camper van parked up . 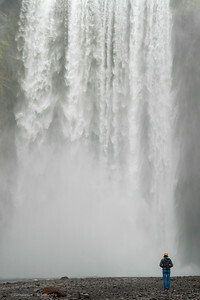 I grabbed my gear & set off up the path that runs round the waterfalls , which are on 2 levels . I knew where I wanted to be so up the top , across & down the other side , being careful on the loose gravel surface . I jumped down to the lower area & promptly decided I wasn't going to the vantage point I wanted , it was wet & looked slippery & I quite liked the idea of not finding out just how cold that water was ! The cloud was still hanging around so I doubted sunrise would be spectacular . 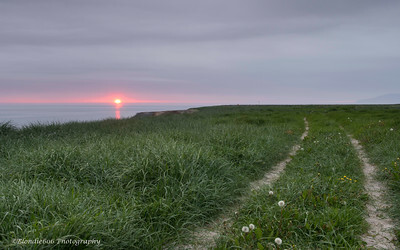 I set about getting shots from various angles and headed back to the car about an hour later with the firm intention of returning next year to capture "that sunrise" . Some short distance along the road I found another huge lake with yet more perfect reflections and a very convenient pull in . I jumped down the banking to the pebble covered shore, rattled off a few shots then heard a most bizzare noise . I knew it was a bird but couldn't see it yet it seemed to be all round , 1st to my left then to my right . I found out later it was a Snipe , his wings or tail feathers make a thrumming type noise when they are in mating flight . 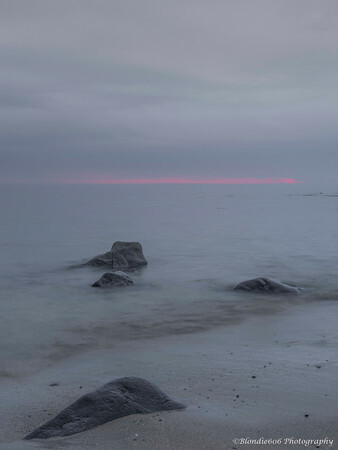 That was the only sound , so peaceful & still , I simply sat on a rock looking out across the water at the slowly rising sun. 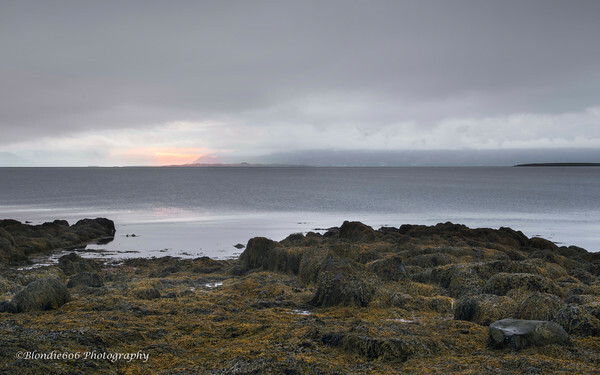 As it broke the horizon I set about taking some photo's , 1st out across the water , catching the reflection across it's top , then turned to capture the rocky shoreline being lit up with the warm colors of the sun . I could have stayed till midday but had other places to see , so reluctantly headed off . It was roughly 04:30 and I felt completely awake and totally relaxed . I set off at steady pace ,taking in the glorious views surrounding me , not really paying much attention to my direction .Turns out I was travelling in completely the opposite direction to that which I thought I was , apparently I was heading left along the coast ! Oh well, no point in turning round so I carried on heading to Olafsvik , Rik and on through the Snaefell National Park , marked by 2 large boulders , 1each side of the road with a large engraving on them .The weather had closed in again , mist & light rain so the views were lost .The landscape I could see was littered with lava rocks and greeny yellow moss , I could but imagine how stunning it could be with bright skies . Next time ! 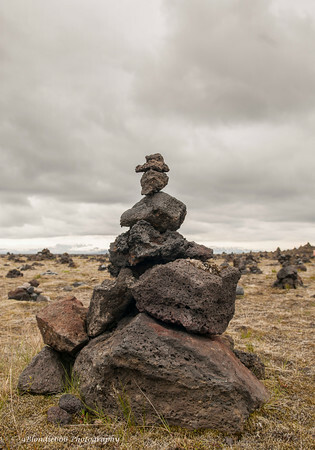 I exited the park , again boulders with signs on them at either side of the road and the landscape subtly changed , less lava more greenery but the misty rain & cloud cover stayed the same . I pootled along at a sedate 50kph looking for my next photo opportunity and spotted a little church sitting on a slight hill over to my right . 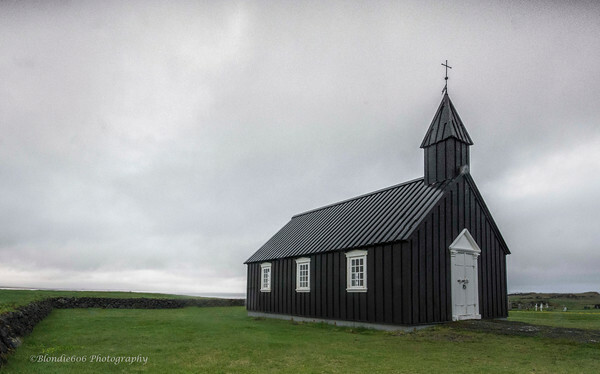 I drove past about 500 yards then something rang a bell & I realised it was the Black Church of Boudir , I recalled seeing a post on the Talk Photography forum about it . I hit the brakes , reversed back along the road & took the turning toward it , it would have been rude not to stop ! There were 2 campers parked in the car park so I opened & closed the car doors as quietly as I could , it was still very early , but trying to walk quietly over gravel was not really possible . 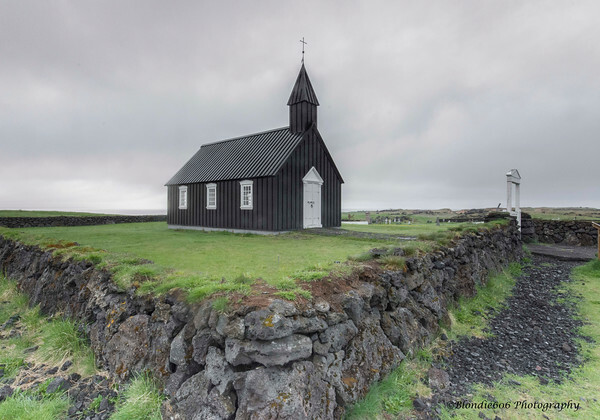 Typical of the design of Icelandic church's this one differed in that it was all black with white window & door frames , a few gravestones standing a 100 yards or so away from it , mountains behind it & sea to the other side , yet again so amazingly quiet with only bird song to be heard . The bland sky and misty rain weren't helping but I took a few shots and then headed off . The sheep in Iceland had so far seemed quite sensible , instead of running across the road in front of me as I approached they tended to stay put or run in the opposite direction ( unlike the birds which have suicidal tendancies!) . However , as I rounded a corner on the little track back to the main road I met a group of 5 , 2 fully grown sheep with 3 lambs , all looking a bit tatty.I stopped to let them cross the road & they just stood there looking at me , then they moved closer to the car , closer still , until they were almost touching the front bumper . They stood for about 5 minutes just staring at me then slowly ambled off to the grass allowing me to carry on .This was obviously their road ! Back on track I followed the road to a junction , a few houses across the way , a stream & mountains , photo stop . Just a couple of record shots including one with my trusty i10 . A few more miles long the road I came across another church , red this time , set back off the road so I turned on to the gravel track that appeared to lead to it . The track got very rough very quickly so I decided to turn round rather than risk damaging the car . At this point the Arctic Terns took huge offence at my presence & started dive bombing the car ! I was obviously far to close to their nests , the silver i10 looking like a monster come to steal their eggs ! I've never experienced anything like it , the Terns swooping in , screeching angrily at me , almost hitting the windscreen & bonnet ! Back on the main road , mist still hanging around spoiling what I'm sure would be stunning views I continued at a sedate pace , it was roughly 06:30 .The map showed some Basalt columns as a possible next photo stop but I never came across them , maybe I missed the signpost due to the weather ? The road was still empty,the tarmac still perfect...oh for a bike ! A large lake or reservoir came in to view on my left & I spotted what appeared to be tents in a little layby ahead . 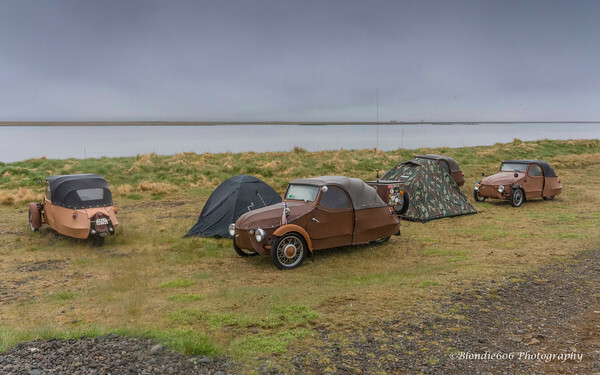 As I drove past I saw 2 tents & 4 vehicles that looked remarkably like Citroen Diane's , but they were 3 wheelers ! A photo had to be taken , quite a random sight ! Photo's taken I consulted the map , I wanted another water fall . Glymur appeared to be the obvious one , back down to Borgarnes , over the bridge , turn left then 2nd righ t, seemed simple enough . I arrived at the fuel station in Borgarnes at the same time as 5 tourist coaches so fueled up , bought some breakfast and quickly headed off again , I guessed they might be going to Glymur as well . Life then started to get a little confusing . The road layout & the map were completely different & I ended up on the right road more by luck than judgement . More of the same black winding tarmac , uphills , gentle corners , stunning views & no other traffic . 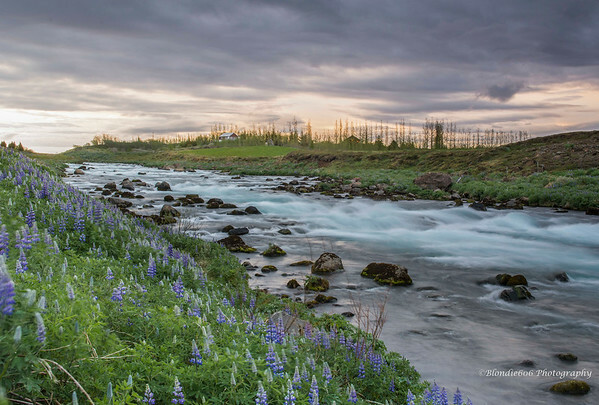 I stopped a couple of times , once for a shot of the valley opening up with a river winding through it and once when I spotted some Icelandic horses ( though they are very small , Icelanders take offence at them being called ponies ! ). 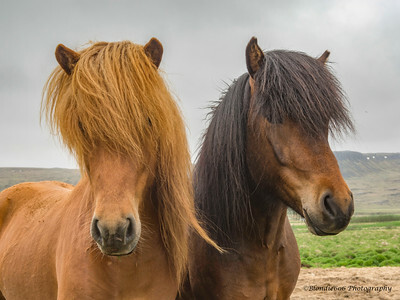 How they see through their incredibly thick manes I don't know ! At this point I also discovered how damn painful electric fences can be , intent as I was on making friends with one of them I forgot how close I was to the fence . Jeez , that bloody hurt ! 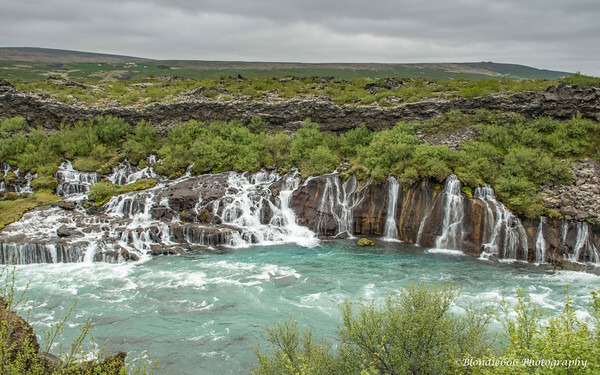 Glymur was the destination , then I added in a detour to Husafell for Barnafoss & Hruanfoss , the map saying the colors were worth a trip . 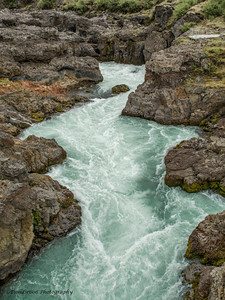 It was right , the rapid flowing waters were again that vibrant aqua blue but getting a good angle to shoot from was difficult . The cliffs down to the water were silly steep and this was possibly the 1st time I'd seen any sort of vague reference to Health & Safety , a rope at the paths edge and the odd sign saying slippery rocks . I didn't stay long as a few other cars pulled in to the car park . The satnav said turn right which I duly did and found myself on a single lane road , still tarmac'd , winding past a expensive looking hotel in the middle of nowhere . Then the road turned to gravel , carry on said the satnav ! 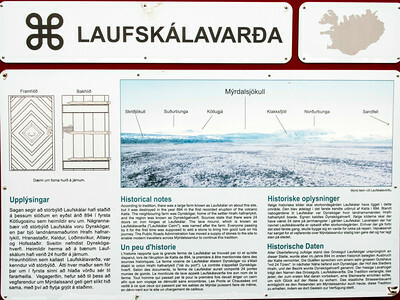 Information boards appeared on my left , giving details of the surrounding villages & roads , I ventured a little further . 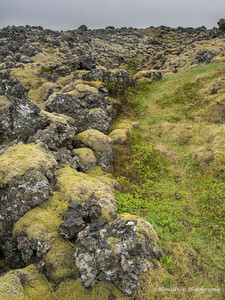 The landscape was open & barren , black sand , lava rocks , a few tree's & mountains as far as the eye could see . 108km's to Pingvellir , not exactly where I wanted to be but I wasn't worried as I had no timetable other than to arrive at the next Hostel by 4pm . Then I saw another huge sign , ahh , this was the 550 Kaldidalur & not open to 2 wheel drive vehicles . About turn & head back to the main road . The satnav , unaware that I couldn't use the 550 , spent the next hour and 1/2 telling me to u-turn ! I re-trace my steps to Borgarnes this time going over the bridge and straight on , back towards that long tunnel , past the speed cameras at a sedate 90kmh looking for route 47 to Glymur . I turn off about 2 miles before the bridge & now start seeing more traffic , only a few cars but enough to make me aware the tourists were up and about . 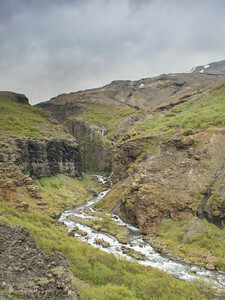 Glymur is the highest waterfall in Iceland at 196 meters and reached by going down a ridiculously rutted & rough track to the car park . There's a large information board giving details of the fall's history , geology , wildlife & surrounding area's & parking for about 50 cars...and it was almost full but then it was midday . I had no idea how much of a walk it was to the falls but I could hear them in the distance . What the info board doesn't tell you is that you need ropes & crampons , a guide , a good head for heights and emergency rations just in case the weather changes on the hike to reach the falls ! 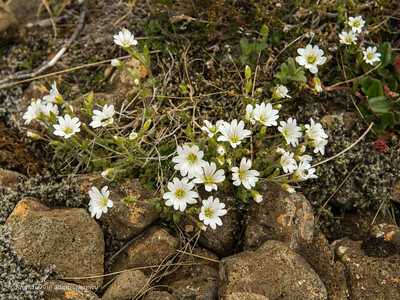 I set off , choosing to leave the camera bag & just take the camera & tripod , the track is mainly large pebbles , rocks , boulders of all sizes , edged with lupins & small white flowers . I crossed several small streams & made my way to a viewpoint . No health & safety here , watch your footing as it's a damn long way down ! Had this been a National Trust Or English Heritage site there would have been an entrance fee , a cafe , ropes galore & metal signposts every so often . 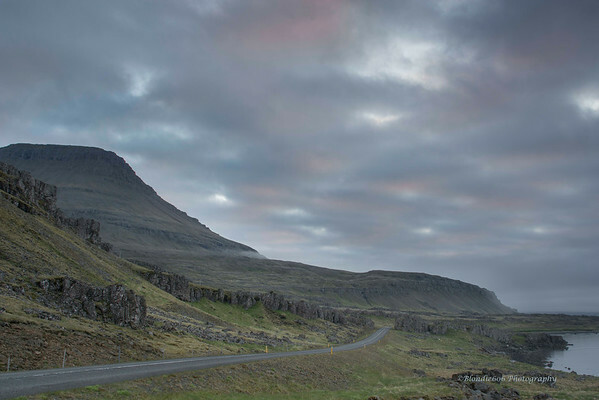 But this is Iceland , a free carpark , a natural track created by the many thousands of tourists over the years with the occasional hand carved wooden sign pointing in vaguely the right direction . You just have to love it ! I take a few record shots from a rocky outcrop and spot the path on the other side of the valley . I've been walking for about 1/2 hour & reckon it's a good same again , down the side of the mountain then back up the other side . I decide against going further . I'm starting to feel hungry and tired and my inhaler is back in the car . I head back the way I've come and stop just before reaching the car park for a photo I saw on the way out . I get stopped by an elderly American couple asking how steep the route is , we chat for a few minutes then I head to the car . I recline the seat & grab a catnap for an hour . I feel slightly better for my nap & head back to the road , turning left to follow Route 47 along the waters edge , going this way avoids the tunnel and gives me yet more OMG moments . The ffjords stretch out on my right & to my left are mountains , rivers , more lupins and the occasional farm .This is another road that offers endless photo opportunities but as it's nearing 4pm I decide to push on . I stop just once to grab a shot of a stream coming down from the mountain . Considering how much traffic passes along this road the surface is spot on,not a pothole or crack to be seen. 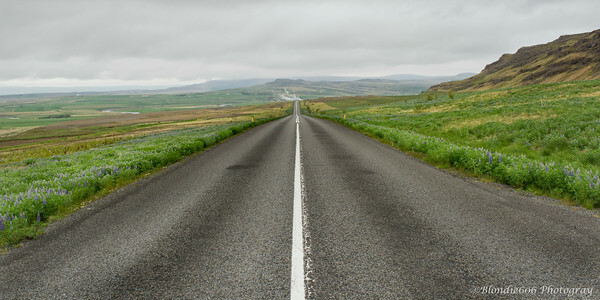 I follow the 47 , join Route 1 and start heading for Selfoss. The light is poor and harsh so I stop just once to grab a shot of a stream coming down from the mountains . This is another one of Those roads , perfect tarmac , twists and turns with a surprise around each of them and I so want to stop but it's nearing 4pm & I need to crack on . I follow the 47 as it loops round the ffjords , join Route 1 and start heading for Selfoss . The rest of the route to the last nights hostel passes with yet more missed photo opportunities and an increase in traffic , I guess this is rush hour . I concentrate on the road ahead watching for speed camera's and try to stay awake . I arrive just before 17:00 , a friendly welcome from the owner and head straight to the shower which is swiftly followed by a cuppa . I check the map & the weather which is not looking promising for my last evening & get my head down for a couple of hours . I only manage an hours sleep , the blackout blinds do a fair job but light creeps in around the edges & my mind is working overtime , processing all the sights of my trip and still convinced that as it's daylight outside I really should be out and about ! At 20:00 I give in , eat my sandwich , have another cuppa and pack up .Quickly check on the weather again and I'm on my way again by 21:00 with a plan in mind . The final night , it's gone so quick and I really don't want to leave so I'm determined to make the most of it ! 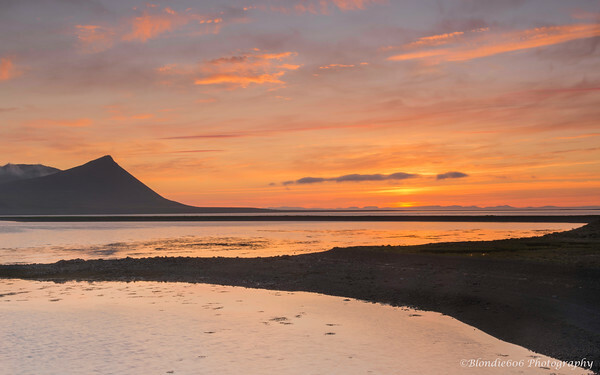 My destination is Hafnarfjorour , more specifically a beach with large moss covered boulders that should make a super foreground for a sunset - if I can find it . At this point the car's fuel range is approx 185km's , plenty to get me back to the airport without another stop . I'd paid for a full tank on collection simply so I didn't have to look round for a fuel station on my last morning . 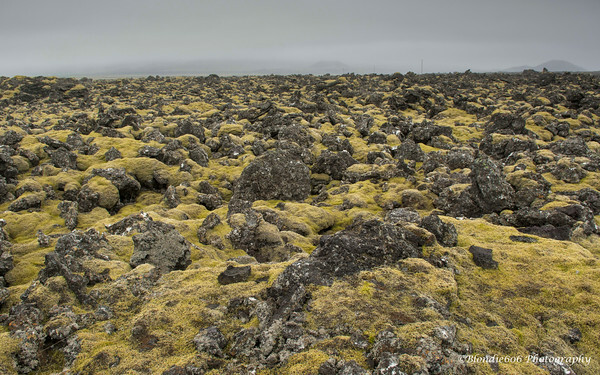 Traffic was minimal & I pottered along never going over 60kmh , to my left the landscape littered with lava rocks , jet black and grey , in places covered with the familiar greeny yellow moss , to my right mountains , their tops shrouded in mist . The island had one more surprise in store for me . I turned right off the main road and found myself on what at home would be a country lane yet still with that perfectly smooth black tarmac . It wound up the mountain side , flat calm water to the right , almost 2 lanes wides if both cars were only i10 size , the drop off to the right being very steep . I passed several pull in's occupied by camper vans probably waiting for the sunrise . 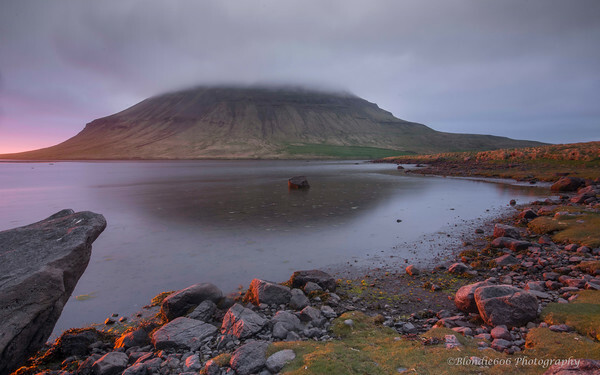 I reached the top , rounded a bend & the view was breathaking .The cloud on the far side of the water was starting to break allowing shafts of light to hit the mountainsides , a slight breeze just rippling the waters surface . I was torn between stopping & reaching my destination ! The satnav then announced that I had arrived ! REALLY ?? 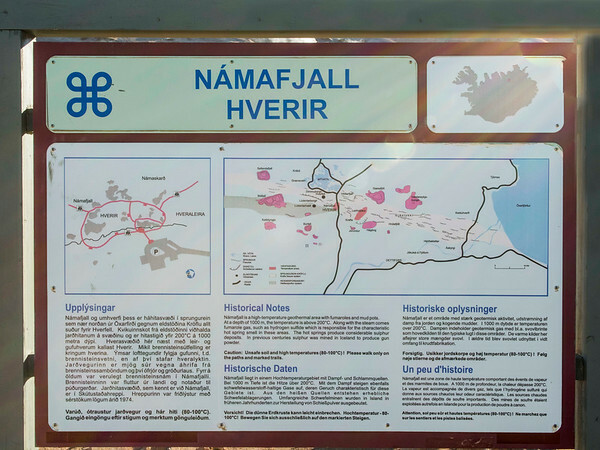 I was in the middle of nowhere and Hafnarfjorour was a built up area , hmmmm . I carried on , the tarmac giving way to a rutted pebble littered track which I wondered if I should be on .What the hell , I hadn't enough fuel to turn back so plodded on at a very sedate pace . After about 5 miles the tarmac re-appeared and a few miles later a fuel station . Showing 65km tank range I decided to fuel up , better safe than getting stranded on my final morning . Life started to get confusing again ! I knew I needed to be down at the waters edge but had no idea how to find the place I was looking for . I took several detours through the town , finding the harbour but not the beach I wanted . I kept turning left hoping I'd eventually find a beach as time was marching on & the sky was starting to show a little color , sunset was happening ! Eventually I saw a side road that led on to a beach so I decided it was the best place I was going to find . 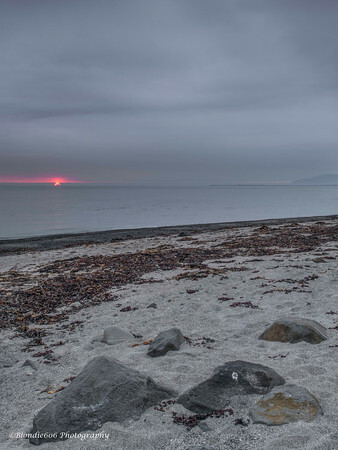 I strolled along the grassy dune that ran atop the beach and managed a couple of shots of the sun just going down over the water , then headed on to the beach for a couple more . 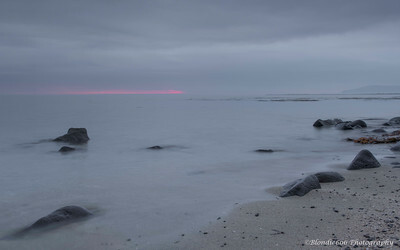 I walked probably about a mile along the water's edge towards some large boulders , climbing over a fair few till I reached a spot I liked , the sky still held slight color though again the clouds were quite heavy . I set the tripod up for a few long exposures and whiled away an hour or so . A thought popped in to my head , I'm on a beach , the sea is tidal....... I wonder what time the tide is due to come in ? 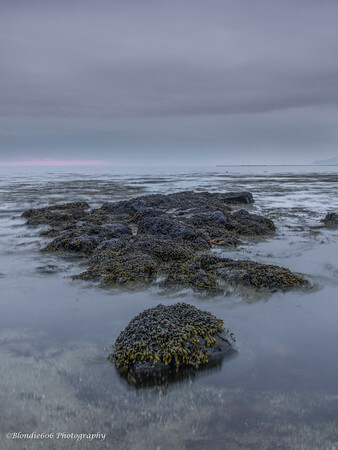 If it came in now I'd be a little stuck , the only way back would be under water so I'd need to climb the sea defence wall to reach land , this was not an option I fancied whilst carrying camera , tripod & rucksack so I packed up & started back to the car. The Eider ducks , gathered in a group at the waters edge , took flight as I crunched my way past them & I apologised out loud for disturbing them . 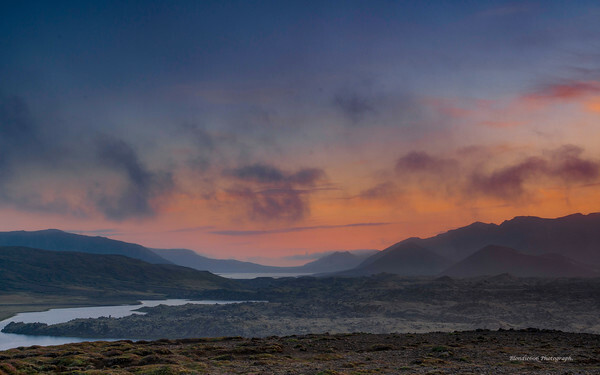 I decided to head in to Reykjavik and the find the Sun Voyager sculpture , I'd been there on my previous visit a year ago so already had plenty of photo's of it but as time to sunrise was short it would have to do . There were a few people already there so I drove past , following the map out to the end of land & Grotta lighthouse . Again just a couple of cars in the carpark , the lighthouse looked a great spot for a photo but I couldn't find a way of getting out to it and my tired brain couldn't see any decent lead lines so I walked back along the front & found a break in the sea wall that allowed me down on to the rocks below . 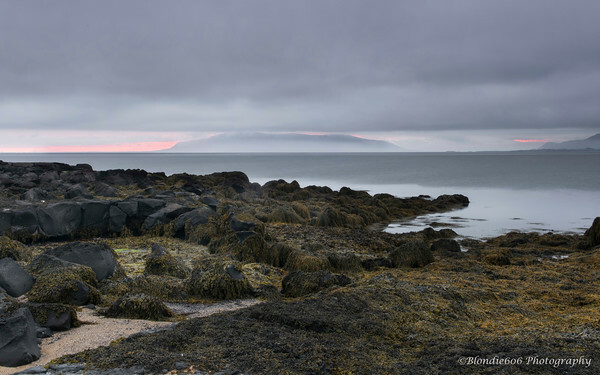 The cloud started to lift a little bringing the distant mountains into view , barely a breathe of wind meaning the sea was wonderfully calm . Given I was less than 1/2 mile from the capital city there was no real noise , just a few Terns and Gulls singing away . The sunrise started , pinks and yellows lighting the sky between the distant peaks , then the cloud started dropping lower over the mountains . Undeterred I snapped away , moving from one set of rocks down to the sandy area for a slightly different view . I became aware of some teenagers to my left , from the accents I guessed at locals , laughing and joking amongst themselves . 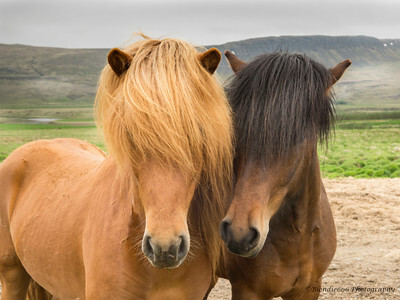 One of them spotted me & came over , greeting in me in what I presumed to be Icelandic . 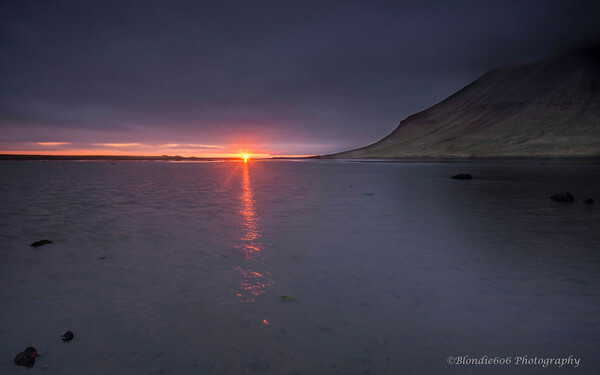 I know very little Icelandic ,Tak being the main word then Goan daggin ( or similar) which is good morning. He was a local but hailed from Argentina originally and he and his friends often came to this spot to watch the sunrise . He wished me a fun morning and they headed back to their car . Had that happened in England I think I'd have been worried for the safety of my gear & myself which is quite a sad thing to feel . As I suspected the sunrise didn't develop in to anything spectacular but just sitting there for 3 hours was heavenly . Reluctantly I packed up around 04:30 , re-organised my case in the car & set off for the hire car depot . Pro car are based just outside Keflavik airport ,I dropped the car back , finalised the paperwork & hopped on the shuttle bus . There was one other gent with me , also from Yorkshire , he'd been over for 10 days and had been here every year since 2008 . Although at times I'd wished I'd hired a 4x4 he told me the Interior roads were still closed as spring had been so cold , so I wouldn't have benefited from spending the extra money. At the airport I headed straight to the loo's to get changed into lighter weight clothes for travelling . Here I must mention keflavik airport toilets which may seem a little odd ! It seems the airport designers recognised that the normal size of cubicle is way too small for those travelling with suitcases and designed accordingly .You could hold a party in them , floor to ceiling marble tiles , a sink big enough to bath in & spotlessly clean , other airports should take note ! I checked in super quick , did a little gift shopping , bought a sandwich for the plain and headed to my gate . As it was just gone 06:00 and boarding not due to start till 07:30 I was the 1st one there . I sat down and the next thing I knew it was 07:50 , best I join the queue then , as I had a reserved seat I wasn't too worried about being last on board ! After take off I ate my sandwich and promptly fell asleep again waking about 10 mins before landing . 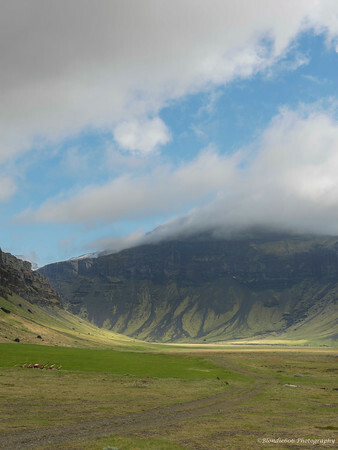 And then my fantastic Iceland trip was over , back to reality and a mini heatwave . I can't wait to return next year and travel the full ring road all round the island !